My family’s trip to Seminole County was sponsored by the local CVB. Many thanks to Orlando North/Seminole County for hosting us in your lovely community! For most Floridians, planning a family vacation is a no-brainer – we head to Orlando and hit the theme parks. Disney World, Universal Studios, Sea World, water parks, themed resorts…fun for the whole family, and all within driving distance from home. With ticket prices and packages made especially for Florida residents, you can plan your entire vacation with just a few mouse clicks and a credit card. Orlando theme parks are great – I happen to love them, and my family & I have even purchased annual passes for some of the parks now that my kids are a little older. But they do have a few drawbacks. Theme parks are almost always crowded, the lines are long, and the weather is unpredictable – all of which make meltdowns almost inevitable (and I’m not just talking about the kids). A week in Orlando is a great idea – but spending 5-7 days in a row at theme parks? Not so much. What most non-locals don’t realize is that there’s a lot more to Orlando than theme parks and nightlife. My family and I recently had the opportunity to spend some time in Seminole County, which is about halfway between Disney World and Daytona Beach. Seminole County (also called Orlando North) includes Lake Mary, Sanford, and Altamonte Springs. These are great little cities – not all that different from the city that I (or maybe you) live in. They have tons of family-friendly activities, affordable accommodations, a huge variety of casual & fine dining, and state-of-the-art sports facilities. But what makes them stand out is their proximity to the hottest vacation spots in Central Florida – the gorgeous beaches on the east coast and all the major attractions in the Orlando area are just a 45-minute drive away. The other thing that makes Seminole County really special is its acres of wilderness, preserves, and pristine waterways. Seminole County is home to some of Florida’s most spectacular natural attractions, including the Wekiva River (one of only two National & Wild Scenic Rivers in the entire state of Florida), the St. Johns River, Wekiva Springs State Park, the Central Florida Zoo & Botanical Gardens, and more than 30 parks and preserves. During your Orlando vacation, take a break from the theme park frenzy with a day-trip to Seminole county. Make Seminole County your “home base” during your Orlando trip. Spend a few of your vacation days in the theme parks, and spend the rest of your time enjoying the slower pace of the suburbs. The Central Florida Zoo has over 500 animals, including the Southeast’s largest collection of venomous snakes and non-venomous reptiles. The zoo’s most recent addition is a giraffe exhibit, where visitors can hand feed Rafiki, Emba, and Gage. You can also feed the animals at the Barnyard Buddies Children’s Zoo – stop by and meet the goats, llamas, alpacas, and even roosters. 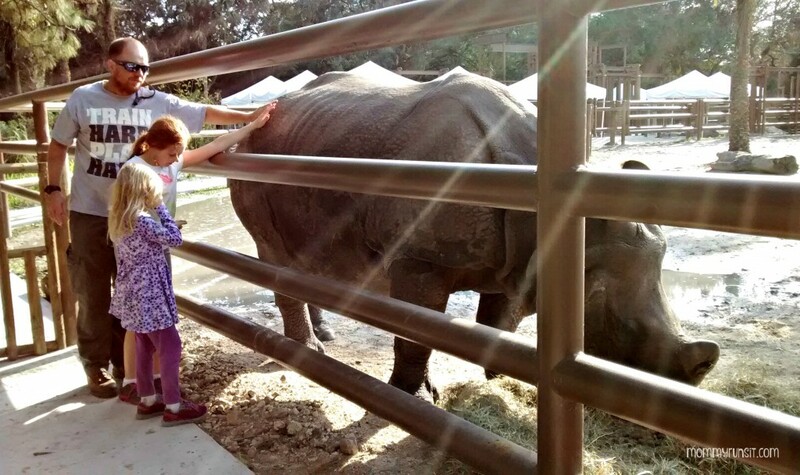 One of the highlights of our trip to the zoo was the Rhino Encounter, where we got up close & personal with two very friendly rhinoceroses! At the zoo, you’ll also find ZOOm Air Adventure Park. This unique adventure course allows guests to explore lush natural habitats from an animal’s perspective – in the air! Families can “ZOOm” from tree to tree by zip lines, rope bridges, suspended disks, and more. The airboat tour was another trip highlight for the family – probably my favorite activity of the whole weekend. We went for a 30-minute Airboat Adventure on Lake Jesup in Oviedo. With well over 10,000 alligators, Lake Jesup has the highest population of alligators in the entire US – and we saw lots of them! And Lake Jesup’s historic Bird Island is a bird watcher’s paradise – look closely and you might spot bald eagles, osprey, herons, and more. We also caught a glimpse of an alligator snapping turtle. Even in January with cooler temperatures, it was a gorgeous day for a boat ride. Nothing but blue skies and sunshine. If you haven’t been to a Rebounderz, you’re missing out on some crazy fun! We spent some time at Rebounderz of Apopka, where all of the kids (and some of the grown ups, too) had a blast on this massive indoor trampoline arena. They played dodgeball and basketball, and they even got to bounce in a foam pit. There was plenty of seating and concessions for us non-jumper types, too. 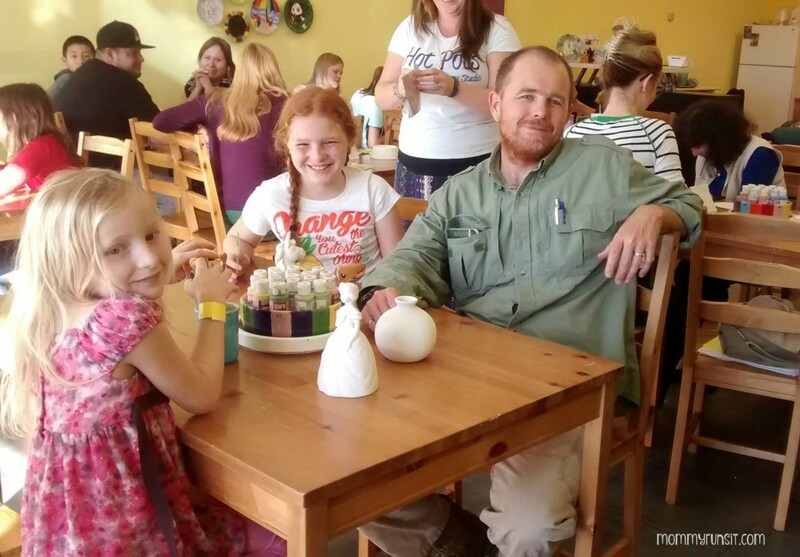 My husband’s favorite weekend activity was painting pottery at Hot Pots! Pottery Studio in Sanford. (Our girls get their artistic talent from him.) It was a really nice, peaceful activity to share as a family – and something the four of us have never done together before. Believe it or not, we’ve never played mini golf as a foursome either (except one summer on a cruise ship, but that doesn’t really count). 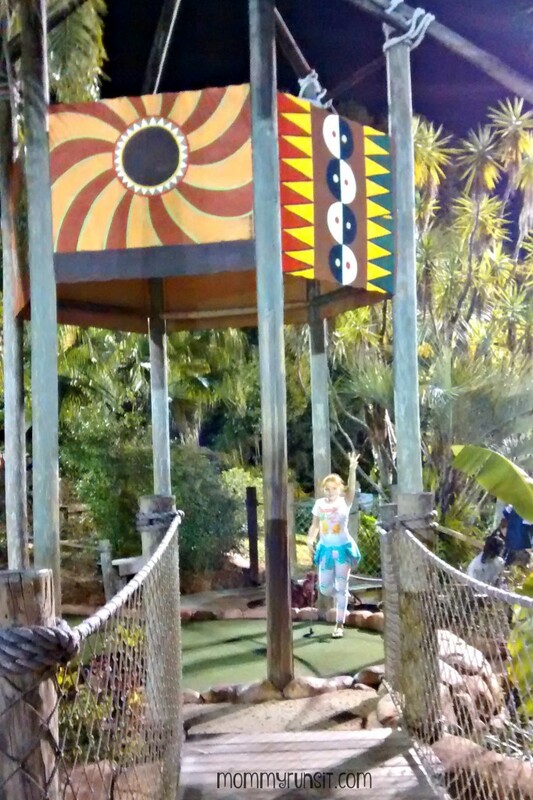 Congo River Golf in Altamonte Springs has a super pretty course, with giant waterfalls, rocky summits, mysterious caves, and tropical rainforests. The course was challenging but really fun! And everyone in our group got really into the bonus scavenger hunt too. Oh – and I was able to keep track of our scores on an app, which I loved! Way better than fumbling in my pockets for the pencil and scorecard at every hole. Two words: Marshmallow Factory. Wondermade Cafe in downtown historic Sanford is a real treat. 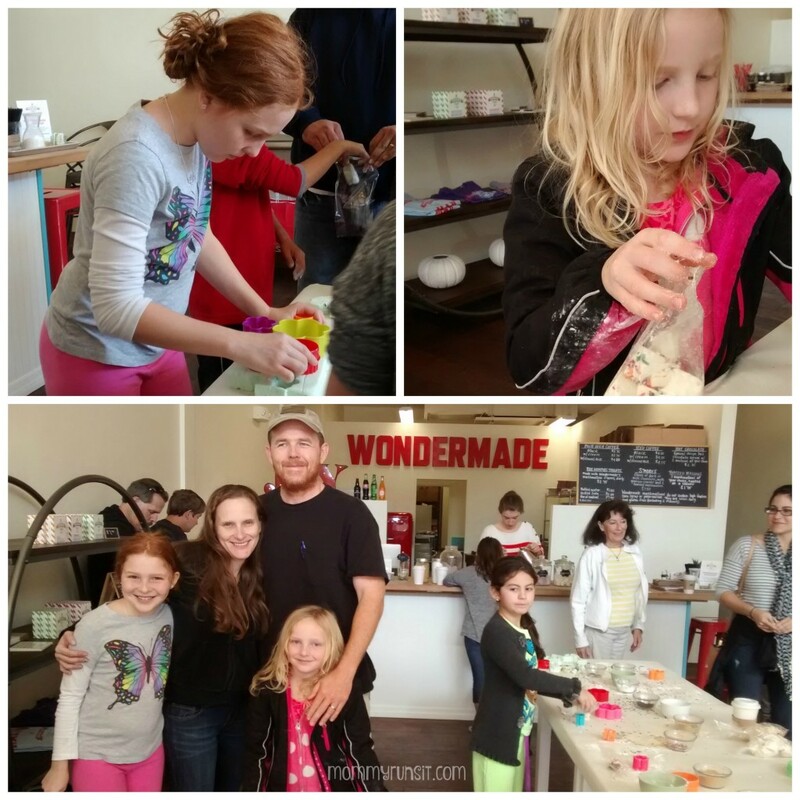 We got to take a tour of the Wondermade kitchen, watch them make flavored marshmallows (vanilla, strawberry, mint, maple, yum! ), and then decorate our own. And then we got to drink homemade hot cocoa (with Wondermade marshmallows, of course) while the kids decorated their own marshmallows. We ran into some bad weather during our weekend in Seminole County, so we weren’t able to make it to the Geneva Wilderness Center – but I hear it’s a must-see. 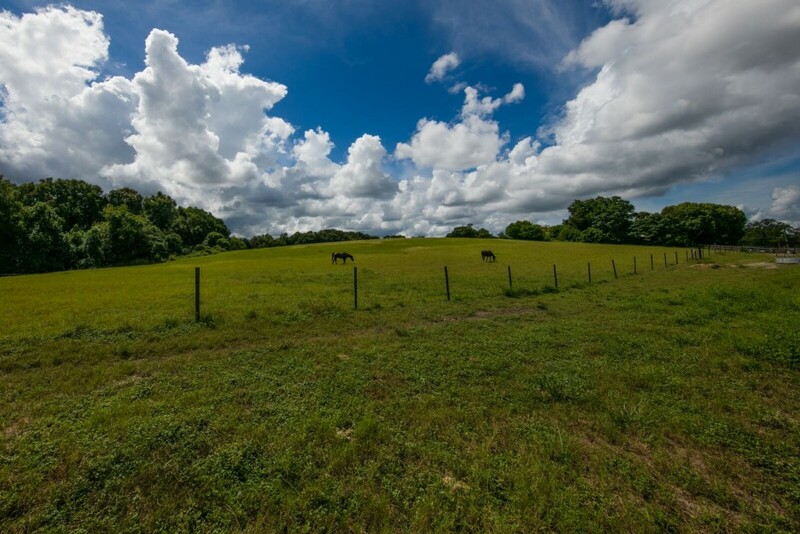 This 180-acre property features a beautiful variety of flatwoods, ponds, and lake systems all supporting an equally diverse collection of wildlife. Go for a hike, and you might be lucky enough to spot a white-tailed deer, gopher tortoise, wild turkey, or grey fox. (You might also see a wide variety of snakes – not as lucky.) Follow the tree markings for quick hike, or take a more leisurely walk and stop at the chapel and enjoy a view of the lake. If you’re an experienced hiker, you can try some of the more challenging trails. If you’re into bird watching, you’ll want to check out the Florida National Scenic Trail – a 1,300 mile trail that runs from the panhandle to the Everglades. The trail is mostly unpaved except in Lake Mary, where it crosses the Seminole Wekiva Trail and the Cross Seminole Trail. 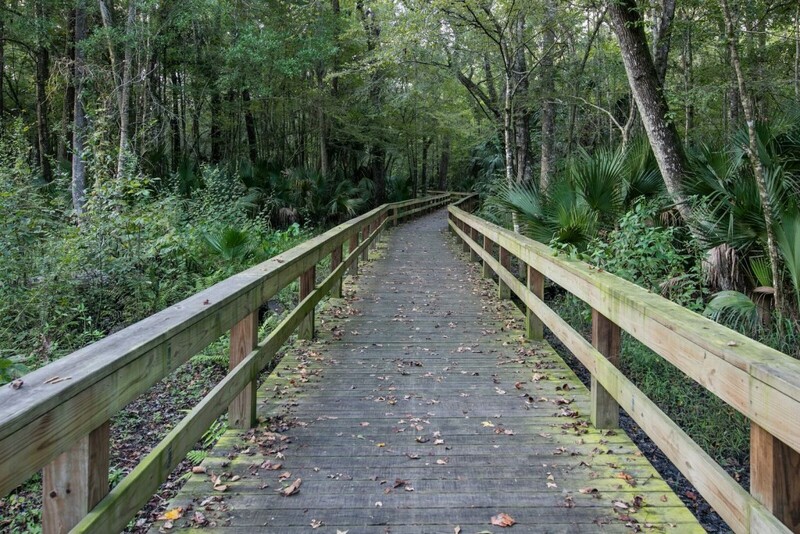 These two trails have been designated as Seminole County Showcase Trails because of their length, scenic views, and ability to accommodate a large number of users. Seminole Wekiva Trail is also a popular spot for runners. This well-marked, 14 mile route runs along the former line of the Orange Belt Railway. The rain kept us from our kayak trip too, but that just gives us a great reason to go back and visit again! 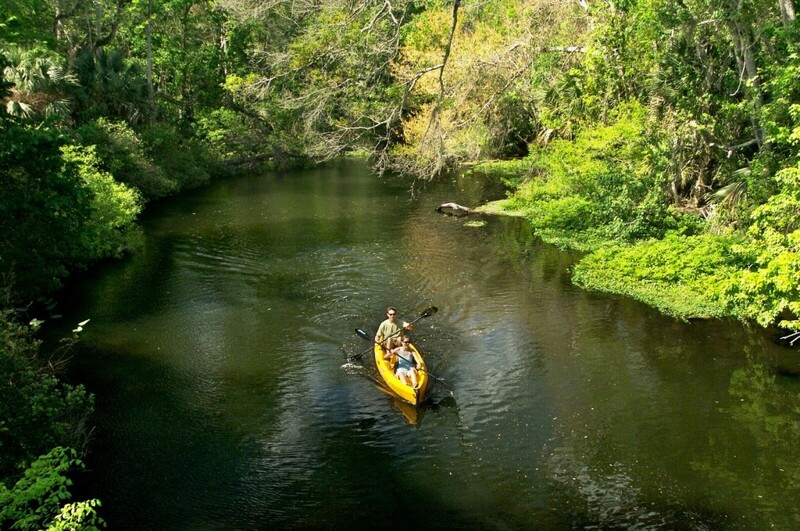 The Wekiva River is one of the area’s most popular attractions. Visitors can paddle the 15 mile trail of the gentle Wekiva River and then go horseback riding at Wekiva Springs State Park. Florida friends, help me out – am I missing anything? What are your favorite Orlando North spots? Amazing!!! Are you coming to BlogHer or just vacationing in Orlando? Very timely post – we’re planning an Orlando vacation for April. Are there any alligator parks there? My middle daughter is OBSESSED with Gator Boys (writes them letters & everything). Hi Janice! Black Hammock Adventures Airboats has a killer gator exhibit. We (not me, I’m chicken) got to hold a baby gator. My girls loved it. Have fun in Florida!!!! Thanks so much Sharon for all your insights into what makes Orlando North, Seminole County so special! Thank you, Mary Jane! We had such an amazing time. We will be back for sure.